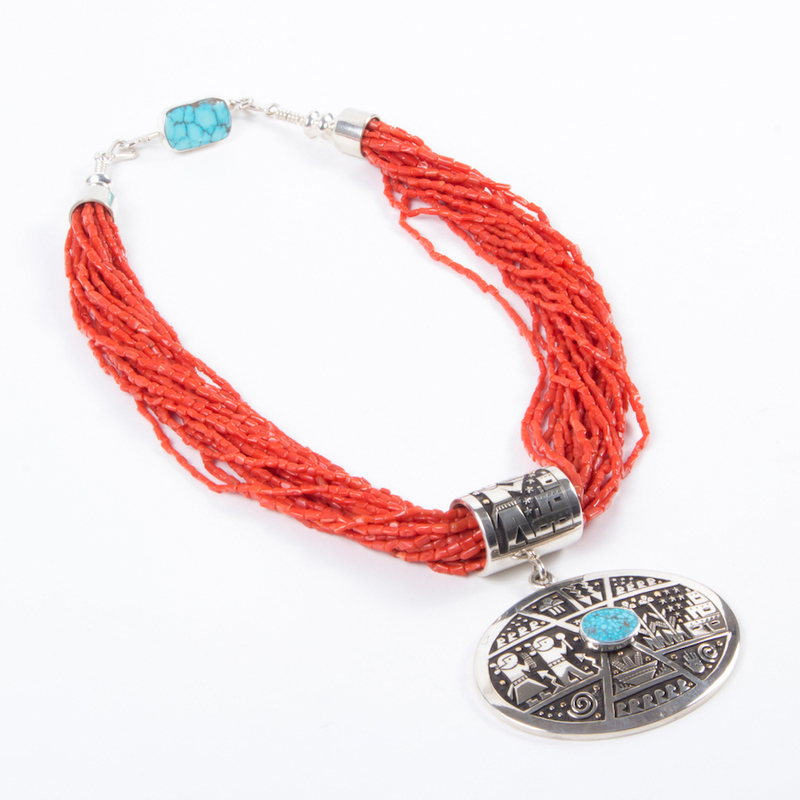 Joseph Coriz, a self-taught silversmith from Santo Domingo Pueblo, has been making jewelry for about eight years. His first tools came from his mother, Clara Pajarito. Joseph’s early pieces were made from brass and copper. After a year or so of working in a more traditional style, Joseph decided that it was time to do something different. A walk around Santo Domingo Pueblo gave him the idea to do village scenes. The first piece in this style was made for his girlfriend. Today, Joseph’s work continues to evolve. Looking at his pieces, one is awed by his command of the overlay technique. He skillfully uses his jeweler’s saw to create individualized village scenes – adobe homes with ever present ladder, trees, and hornos, all warmed by a 14K hold sun. Other design elements, such as turtles and corn plants, are elegantly arranged on earrings, bracelets, buckles and bolos. Pottery motifs are another favored design, inspired by his friend, the well-known potter, Robert Tenorio. Joseph is now teaching his daughter, Merlinda, to do overlay silversmithing so that she can continue his work.